Not many Chinese can say the words 'I Love You' easily, and some may even react with fear or suspicion on hearing it - but that's because the culture puts action before words. Tiffany Tan reports. 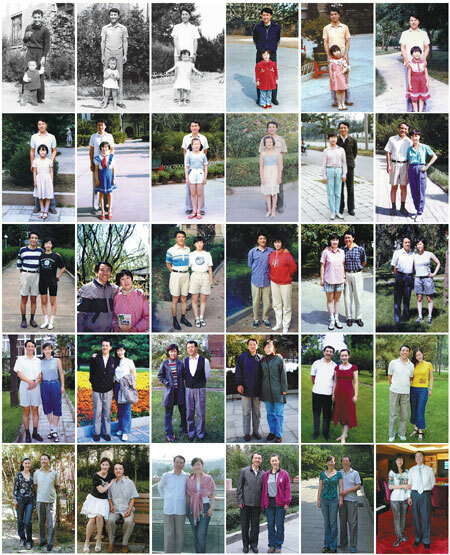 For Father's Day last year, Zhao Mengmeng made her dad an album of their photos taken at around the same date for 30 straight years. The first in the digital collection is a black-and-white print that shows Zhao at age 1, standing with her dad outside a brick building, her hand engulfed in his. The last shows the pair in full color three decades later, posing against a piano and a chandelier, Zhao's arms linked at the elbow with her 62-year-old father. The album, which Zhao also posted on her micro blog, is seen as a remarkable expression of a child's love for her parents. It has since been viewed hundreds of thousands of times. A video of their story, found online, has been watched at least 2 million times. "I'm delighted the collection of photos can remind the public that time is fleeting, and so it's important to cherish time with family," Zhao says. "Sometimes people are too busy and take the love and care from their parents for granted." Besides creating the album and sharing it with the public, how else does Zhao express her love and gratitude to her parents? By keeping an eye on their health, buying things they need and helping them run errands, says the 31-year-old online media editor. Has she ever told them "Wo ai ni" - I love you? "I've never said it face-to-face," she says. "I think saying it is a bit odd." Even to her own husband, she says, she only utters the words when she's joking around. Using a serious tone, she probably says it "once a year, or twice every three years". Zhao is typically Chinese. Declarations of love, especially between parents and their children, are highly unusual among the Chinese. It's so unusual that last year, several local TV stations decided to tape the reaction of parents who got a call from their child just to say, "I love you." "What's going on?" one father said. "Why is my daughter this happy today? Has she finally found a boyfriend?" Some pretended not to hear. "Are you coming home for Mid-Autumn Festival?" one mother replied. When her daughter repeated the three words, she said: "I've already sent the money." Another mother was convinced the line was merely a ploy to get something in return. "OK, what do you want, dear?" she said. "I don't want anything," her daughter said. "I just really love you." "Just say it. What do you want?" Most Chinese believe that when it comes to expressing love, actions are more important than words. In the Confucian tradition, parents strive to provide their children with a good life, such as quality education and their own home as a wedding gift. In return, children are expected to respect their parents and obey their wishes. "They tend to express their love through actions and oftentimes leave their good intentions and love unspoken," says Wei-jun Jean Yeung, a professor with the National University of Singapore's department of sociology and Asia Research Institute. "In fact, this is viewed as a virtue in the culture." Generations of Chinese grew up hearing stories of sacrifice in the name of love, such as those in The 24 Filial Exemplars, published in the Yuan Dynasty (1271-1368). The classic text on morality includes the heroism of Dong Yong, a figure from the Han Dynasty (206 BC-AD 220), who sold himself into slavery to pay for his father's funeral. It also talks about 8-year-old Wu Meng, from the Jin Dynasty (1115-1234), whose family was so poor they couldn't afford a mosquito net. On summer nights, he offered his blood to a swarm of mosquitoes so they would not sting his parents. 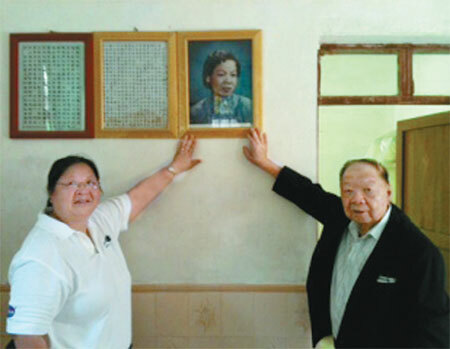 Last year, the government updated the filial piety standards for the 21st Century. The New 24 Filial Exemplars, released by China National Committee on Ageing, suggests adult children teach their parents to surf the Internet, buy them insurance and help widowed parents get remarried. Interestingly, item No 11 says: "Tell parents that you love them." Meanwhile, overseas Chinese are still influenced by the norms of their native land. That includes those in the United States, where families usually say "I love you" to each other regularly. Fiona Lee, a 32-year-old California resident whose parents hail from Guangdong province, says her parents use English whenever they say "I love you" - although their first language is Cantonese. "My theory about this is that, although in Chinese culture you don't really say it, American culture is more permissive and open, so English is the language we use to express deep feelings," she says. Soi Chong Powell, 54, whose family moved from Hong Kong to the US Midwest in the 1950s, says she doesn't remember her parents telling her and three siblings "I love you" until they had left for college. But since their mother died several years ago, she says, her family has been saying it to each other more often. "We probably still don't say the words as much as our non-Asian friends," Powell says. "I'd like to think that I show my love by spending time with my dad and seeing to his well-being, like asking my cousin to set up his TV with a streaming box so he can watch Cantonese TV." The "cultural revolution" (1966-76) also contributed in maintaining the status quo on declarations of love. It fully developed the collectivism and hierarchy of the traditional Chinese culture to the extent that personal interests, emotional desires and traits should be subdued to the collective needs, such as the work unit, village, society, Party or nation, says Ji Yingchun, a research fellow at the National University of Singapore's Asia Research Institute. But with economic development and globalization, some Chinese are now becoming more vocal about tender feelings. Meiyan, a Beijing housewife and part-time worker, who declined to give her full name to protect her privacy, says "I love you" to her daughter almost every day. She has also taught the 6-year-old to say the words back. The 32-year-old mother says she has never spoken those three words to her parents, although she sometimes wants to. But her parents, farmers in Hebei province, would not understand why she's saying it and might think something is wrong. So instead, she is empowering the next generation with the words. "She will be able to say what is in her heart," Meiyan says. And how often does she tell her husband "I love you"? "Rarely," she says. "And I never say the words first." Certain cultures, families and couples do have their own language of love. Hundreds of millions of Chinese speak theirs every day. Contact the writer at tiffany@chinadaily.com.cn. Sun Ye contributed to this report.